It’s been over five years since FTL: Faster Than Light came out, gracing us with one of the best roguelike games of this decade – and that’s not even an exaggeration. 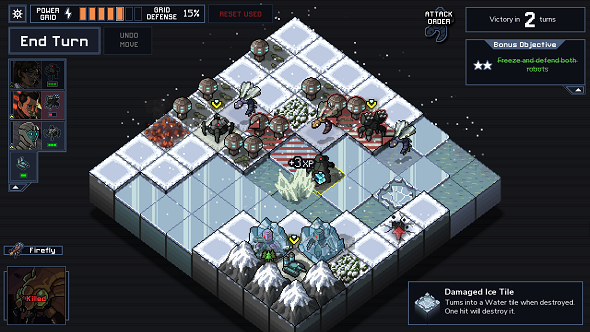 Updates have come out since, but otherwise, the developers, Subset Games, have been hard at work on their next game, Into the Breach, which comes out tomorrow. To give you an idea of what’s in it, the launch trailer is out now. You’ve only got a day to wait for Into the Breach to come out, but if you can’t, here’s the best strategy games on PC. Caught by Rock, Paper, Shotgun, and strangely only available on Vimeo right now, the trailer shows off what you can expect, and it’s very different to FTL: in case you were hoping for more spaceship-flying action, don’t expect too much. It’s a turn-based strategy game that’s more like Advance Wars, or perhaps X-Com, than anything else. A finalist for the IGF 2018 grand prize, it’s been receiving a lot of praise ahead of release – the aim of the game is to eliminate an alien threat in procedurally generated missions, using robots and the environment to wipe out enemies. The trailer shows off a bunch of tactics you can use, from just straight up annihilating enemies with sheer firepower to knocking enemies down into the sea to launching a tank into the air as a forward attack unit. Like that bit from the 2010 A-Team film. It doesn’t appear to be quite as unforgiving as FTL was, though, as when you lose, you can send units back through time so that another timeline can have those resources. It’s all quite ludicrous sci-fi – and sounds great. The game is going to be available through Steam, GOG, and Humble Store, and costs $15 (other prices haven’t been published yet, expect it to be similar to your regional equivalent).